So far there hasn't been a lot of snow. Early December had a lot of rain and warm temps all over the state. Temps have been cold for a while now. The wind has been blowing and the snow has blown away a lot of places. Below is a short report by Invitational volunteer, trail groomer, Rohn& Shell Lake checker Michael Schoder.
" If the race was today it would be the fastest ever between Swentna and Fingerlake. Trail is hard, wide, smooth and not very brushy. There is almost zero snow at Fingerlake, .the wind blew it away. I will be trying to punch up to Puntilla on Wednesdy or Thursday. Trail broke to Happy steps now." Once again one of these warm weather patterns has hit Alaska. All the way from Anchorage to Barrow, there are reports of freezing rain. Roads and sidewalks are a solid sheet of ice. Schools were canceled in Anchorage and the Mat-Su Valley. We have seen this before in previous years. I remember 2003. 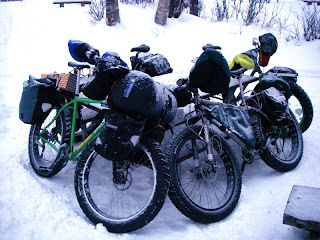 I found the best means of transportation is a bicycle and really good studded tires such as the Nokian studded tire. This is an article in the ADN today. Some of our friends in Anchorage and Palmer are finding ways of coping with this fluke of nature. We hope this crazy weather pattern doesn't last much longer and we return to real winter and great trails. This December the inaugural winter bike race Sheep Mountain 150 will get underway. Sponsored by Arctic Cycles the race follows the dog mushing trails of the Sheep Mountain 150 race. There will also be a shorter 100 mile race. 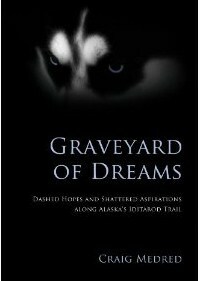 This will be another qualifying event to enter the Iditarod Trail Invitational race. The race roster of the Invitational has been full since May, but there are still spots left in these other races to qualify for the 2012 event. White Mountains 100 FULL wait list! April 8, 2010 for rookies (new racers). Great race stories by these racers about the 2010 race which just finished.